I point out in this blog a recent paper by Bernhardt and colleagues describing fricative production by Icelandic preschoolers with “protracted phonological development”. Icelandic-speaking children with speech problems produced /f,s,θ/ with about 70% accuracy by four years of age. The English-speaking children with speech problems achieved less than 15% accuracy on the single word naming task (those of us who work with those children are not surprised!). Error patterns were different as well (for example, the Icelandic children substituted [t] for /f/ whereas the English children substituted [p] for /f/). The study is a nice reminder of the need for language specific articulation tests for children with intelligibility problems whose first language is not the majority language. There are no universal developmental patterns. Therefore we can be grateful to Sharynne McLeod and the International Working Group on Multilingual Children’s Speech for their great site. Françoise and I have previously pointed out that the prosody of French helps children learn the segments. Several studies now confirm that French-speaking children learn consonants early: they have a complete consonant repertoire at an early age and they master accurate production of the consonants at an early age (compared to English). Furthermore, French-speaking children with speech problems produce more syllable structure and fewer segmental errors (compared to English-speaking children with speech problems). How does the prosody of French explain these findings? French is a syllable timed language with a tendency toward long words made of several syllables having equal stress. The syllables tend to have a simple CV structure even though complex onsets and codas are allowed. The difference between the two languages can be observed in the ratio of consonants to vowels, being 1.6 in French and 2.1 in English. Recall that when children first learn to speak, they learn to produce “whole words” and not strings of individual segments; these first whole words act as templates for the production of more words. These initial templates are often made up of reduplicated or partially reduplicated syllables. Possibly, if the initial word shape template is easy to learn or construct, more processing power is left over to acquire the segments inside the syllables. Furthermore, simple stressed syllables in French may increase the perceptual salience of those segments. Vihman provides wonderful examples of this process in her very excellent paper on templatic phonology. The French child, Gael, saying words like ‘accroché’ [χʁoʃe] at age 21 months is rather fun to see! Possibly the same process occurs in Icelandic which has a very particular prosody that may also increase the perceptual salience of postvocalic consonants, fricatives in particular. I will not attempt an explanation, the phonology of Icelandic being quite beyond me, but any explanation for the early acquisition of these phonemes must take the prosodic (word shape) characteristics of early child input into account. In the meantime some more general points strike me. It is impossible for us as speech-language pathologists or academics to understand the process of speech development without data and it is disheartening how little data there is on these languages. Basic information such as the types and tokens of fricatives that are presented to children in the input across languages is difficult to find. We need to know much more about the prosody of all these languages but prosody receives scandalously little attention compared to, for example, consonants. We also need to know more about the processes by which children select and construct their early word templates. This requires painstaking small sample detailed longitudinal work and large, large sample laboratory work using creative paradigms, some probably not invented yet. However, all our work is perilously underpowered and underfunded. Finally we need huge diversity in academia – lots and lots of movement of students across the world, bringing new techniques to new languages. Unfortunately in the past few days, in the aftermath of Brexit, I have encountered many depressing conversations on the internet about the control of borders. Even in the domain of “highly qualified personnel”, some graduates are deemed more worthy than others and we all know where the humanities fall on the ranking! I prefer not to counter this sort of thinking with purely utilitarian arguments, but clearly it is short sighted given the importance of communication and communication disorders. On a more positive note I close by congratulating the excellence of child phonology projects sustained on a wing and a prayer such as the Cross-linguistic Child Phonology Project led by Bernhardt and colleagues and also the Paidologos project led by Edwards and colleagues. Brosseau-Lapré, F., & Rvachew, S. (2014). Cross-linguistic comparison of speech errors produced by English- and French-speaking preschool age children witih developmental phonological disorders. International Journal of Speech-Language Pathology, 16(2), 98-108. MacLeod, A. A. N., Sutton, A., Trudeau, N., & Thordardottir, E. (2011). The acquisition of consonants in Québec French: A cross-sectional study of preschool aged children. International Journal of Speech-Language Pathology, 13, 93-109. Jon Preston is in my opinion the most interesting researcher to watch in the field of speech sound disorders. His recent studies on structural and functional brain differences in older children with persistent speech errors are very interesting. The two studies complement each other and point to structural and functional differences in supra superior temporal gyrus, consistent with repeated findings of perceptual deficits in children with speech deficits. Additional differences in supramarginal gyrus implicate integration of auditory and somatosensory information during feedback processes that are important for learning to produce speech sounds as well as monitoring and fine-tuning speech sound production as the articulatory system matures. Given these neuroimaging findings, it makes sense to look for behavioral indices of perceptual difficulties in this population of children with persistent speech sound errors. Recently Preston et al (2015) used SAILS to do this with two different groups of school aged children. SAILS is a tool that I developed for speech therapy with preschoolers. Each module consists of natural speech recordings of adults and children producing a word that begins with a commonly misarticulated phoneme, for example, the word “rat”. Half the words are produced correctly and the remainder are misarticulated, e.g., [wæt], [jæt], [ɹ̮æt]. Each module is designed as a series of blocks in which the contrasts are theoretically closer, e.g., practice [ɹæt] versus [mæt], block 1 [ɹæt] versus [wæt], [jæt] and block 2 [ɹæt] versus [ɹ̮æt]. The child’s task is to identify the words that are “good” representatives of the target word. Although the blocks are numbered, they do not necessarily fall into a linear difficulty scale because each child can be quite idiosyncratic in terms of the features that they attend to. I’ll come back to this point later. After establishing that the tool was effective as an intervention for improving children’s speech perception and speech production skills, I found that it also had some value as an assessment tool (Rvachew & Grawburg, 2006) although I do not feel that the psychometric qualities are particularly good and I certainly did not design it for that purpose. Now, back to Jon Preston’s study. In the first study, older children with [ɹ] distortions were compared to children with correctly produced [ɹ] and no history of speech delay. They were administered only the “most difficult” levels of SAILS modules including the [ɹ] Level 2 module. Although 1/20 children with typical speech and 6/27 misarticulators failed the [ɹ] SAILS module, the mean difference between groups was not significant. In the second study, a group of 25 children who received speech therapy as preschoolers was tested with SAILS, 3 years later when the speech deficit was resolved except in some cases for a persistent speech sound distortion. Performance on the “most difficult” [s] or [ɹ] module was correlated with their performance on an [s] or [ɹ] production probe. There was no correlation. (I was initially mystified by the perception results because they didn’t look like anything I had seen before but that was before I realized that the children were not presented with the complete test!). So, how do we interpret these results? I have three comments. First, Preston, Irwin, & Turcios have done us all a good turn by establishing that SAILS is NOT a good tool for assessing speech perception in 7 to 14 year old children with persistent speech errors. I never intended it for that purpose and I am pleased to have empirical evidence that supports a clear answer to the question when it comes up (we should be grateful to Seminars in Speech and Language for publishing it I suppose, despite the small samples, because rumour has it that ‘negative results’ are hard to publish). Anyway, we need something better for testing speech perception, especially for older children. I invite reader comments on what that “something better” would be. We know from many studies using synthetic speech that this population is at risk for perceptual deficits. We need to be able to identify those children in the clinic. Second, if you are going to use SAILS for assessment (with children aged 4 to 7) it is very important to administer the complete module to the child, working through all the levels of the module, in order as intended. We cannot be sure that the child’s response to, for example Level 3 /s/, will mirror that of the normative samples who encountered Level 3 after first working through Practice, Level 1 and Level 2 before getting there. I will come back to this in another post in which I will give a sneak peek at the upcoming second edition of our book Developmental Phonological Disorders: Foundations of Clinical Practice. Third, the relationship between speech perception and speech production is not linear. Even though I have found relationships between speech perception and speech production in the past using some rather fancy statistics with large groups (Rvachew & Grawburg, 2007; Rvachew, 2006), I cannot at the individual child level relate in a simple fashion SAILS score with number of correct productions of a phoneme. The reason is that the child’s production and perception of a phoneme is related to the way in which the child attends to the features associated with phoneme contrasts and certain features have different information value for perception versus production. We give an example of this in Chapter 4 of DPD (from Alyssa Ohberg’s masters thesis): preschoolers who were stimulable for /θ/ and /s/ but had not mastered this contrast were administered the SAILS /θ/ assessment module. Some children, in their speech, differentiated /s/-/θ/ by manipulating the duration cue whereas others differentiated /s/-/θ/ by manipulating the spectral cue; as you would expect, manipulating the spectral cue resulted in comparatively better articulatory accuracy but these two groups produced roughly comparable perceptual performance but with some interesting differences. The children who attended to the spectral cue actually did better on the supposedly “harder” level 3 stimuli than the supposedly “easier” level 2 stimuli, highlighting again that there is not a linear difficulty gradient across the stimulus blocks. The children who attended to the duration cue did surprisingly well at levels 2 and 3. For some stimuli, attention to the duration cue actually provides an advantage. This results occurs because duration is actually a pretty reliable cue for perception of /θ/ but it does not provide any information that helps the child achieve the critical articulatory gestures (e.g., grooved versus nongrooved tongue,interdental versus alveolar tongue tip placement). In this case, there is no direct linear relationship between the child’s speech perception score and their speech production score on the tests that we gave. However, there is a direct relation between the child’s perceptual focus on only one of the relevant acoustic cues and their inability to produce the phoneme correctly. The only children who achieved good perception scores and good production scores attended to both the duration and the centroid cues. This example raises a fourth point and that is, drawing on Shuster’s findings, the best test for older children may well involve using the child’s own speech production output. The most important question is, does the child mistakenly believe that their own productions are accurate and acceptable representations of the target category? I cannot recommend Shuster’s brilliant study highly enough for anyone treating this population. If the child does prove to have incomplete perceptual knowledge of /ɹ/ or /s/ however, treatment that includes highly variable (multi-talker) stimuli remains important, as a general rule of perceptual learning. Preston, J. L., Molfese, P. J., Mencl, W. E., Frost, S. J., Hoeft, F., Fulbright, R. K., … & Pugh, K. R. (2014). Structural brain differences in school-age children with residual speech sound errors. Brain and Language, 128(1), 25-33. Rvachew, S. (2006). Longitudinal prediction of implicit phonological awareness skills. American Journal of Speech-Language Pathology, 15, 165-176. Rvachew, S., & Grawburg, M. (2006). Correlates of phonological awareness in preschoolers with speech sound disorders. Journal of Speech, Language, and Hearing Research, 49, 74-87. Shuster, L. I. (1998). The perception of correctly and incorrectly produced /r/. Journal of Speech, Language, and Hearing Research, 41, 941-950. What’s in a Name? Does SSD Smell Sweeter than DPD? As we discuss the application of the ICF framework in the context of DPD, we must be begin by unpacking the term “developmental phonological disorder” and justifying this choice of terminology to describe this health condition. Since the dawn of our profession, many terms have been used to describe children who have unintelligible or inaccurate speech, with all of the terms reflecting the tongue-in-cheek perspective of Compton (1970) who compared the diagnostic role of the SLP to that of a “TV repairman”! The diagnostic term that is applied specifies the “part” that is presumed to need fixing, either “articulation,” “phonology,” or “speech,” with these terms all in current use although, historically, earlier usages focused on articulation problems and current preference in North America is to refer to “speech” as a cover term that is presumed to include both the articulatory and phonological aspects of the child’s difficulty. We feel, however, that “speech” is too broad a term because it is often used as a cover term for difficulties with articulation, stuttering and voice in epidemiological studies, as seen in Chapter 7. Furthermore, in the developmental context there is no possibility of separating articulation from other aspects of phonological knowledge. Children who appear to have a motor speech problem called childhood apraxia of speech have significant difficulties with various aspects of phonological processing (see Chapter 7 for further discussion of this point). Returning to the topic of cleft lip and/or palate, this structural disorder that might appear at first glance to cause a purely articulatory problem, actually results in speech patterns that are best described and treated with phonological approaches (Howard, 1993; Pamplona, Ysunza, & Espinoza, 1999). Therefore, it is our preference to identify the central issue as being in the child’s developing phonological system, stressing as we do throughout this book, that phonology comprises interlocking components at multiple levels of representation. The diagnostic term also requires one or more modifiers that indicate a specific type of phonological problem. We use the term “developmental” to simply denote that we are referring to children whose phonological systems are still developing. Furthermore, as shown in Chapter 7, the most likely causal factors in the majority of cases are interacting genetic and environmental variables that impact primary neurodevelopmental processes. The modifier “functional” was used for many decades, sometimes replaced with the phrase “of unknown origin,” to differentiate problems that had a known biological cause from those that did not and were therefore presumed to reflect an unexplained failure to learn the required articulatory gestures or an unexplained delay in the suppression of phonological processes. We reject these terms on the grounds that distinguishing between biological causes that are currently known and those yet to be discovered is nonsensical and that, furthermore, we cannot force a pure demarcation between biological and environmental causes. For example, so-called functional speech problems are indeed associated with sociodemographic disadvantages (for discussion, see Shriberg, Tomblin, & McSweeny, 1999) but these sociodemographic conditions are themselves associated with biological causal-correlates such as increased risk of otitis media, fetal and child exposure to parental smoking, and low birth weight. Furthermore, environmental variables and biological maturation are reciprocally related as discussed in Part I: maturation of brain function in areas associated with language and reading development is driven in part by exposure to high quality language input. In another example, Noble, Wolmetz, Ochs, Farah, and McCandliss (2006) demonstrated that socioeconomic status significantly moderates the relationship between brain function and phonological processing even when phonological abilities are controlled across advantaged and disadvantaged groups. The nature of the relationship is such that high quality inputs for children in advantaged homes buffers them from the ill effects of poor phonological processing abilities, allowing them to achieve higher reading levels and higher activations in areas of the brain important to reading than would be predicted on the basis of their phonological processing abilities alone. Disadvantaged children show a correspondence between brain activation and reading ability that is linearly predicted by their phonological processing skills, however. These kinds of studies support a dynamic systems approach to phonological disorders and highlight the joint causal influences of intrinsic and extrinsic factors on children’s linguistic functioning (issues that are revisited in Chapter 7 when we discuss approaches to the subtyping of phonological disorders). For these reasons we prefer the modifier “developmental” rather than “functional” or any other term that strictly demarcates biological and nonbiological causes of phonological difficulties. Finally, there continues to be some controversy about whether the problem should be referred to as a “disorder” or a “delay.” In fact, as we discuss further in Chapter 7, some classification systems explicitly differentiate between children whose speech appears to be delayed by virtue of having characteristics similar to younger normally developing children and those whose speech has characteristics deemed to be atypical. We argue as we move through Part II that the diagnostic and prognostic implications of this distinction are uncertain and that the delay-disorder classification exists more on a continuum of severity than a sharply delineated categorical distinction. With respect to those children who are deemed to have a “disorder” on the basis of “atypical” speech errors or learning processes, it is our impression that the child’s behaviors are only “atypical” in the context of the child’s age or overall profile. For example, inconsistent word productions are often considered to be atypical and yet we showed in Chapter 4 that variable word productions are fully expected in the earliest stages of word learning. Therefore atypical behaviors reflect heterochronicity in developmental trajectories across cognitive-linguistic domains within a child rather than fundamentally different learning processes across children. As to those children who appear to have typical but delayed patterns of speech error, we take the position that some children’s delay is severe enough that it places them at risk for current or future activity limitations and participation restrictions. Consistent with the position of the ICF-CY (McLeod & Threats, 2008), the problem in this case deserves the appellation “disorder”. Furthermore, to be consistent with the dictionary definition of the word “disorder”, this appellation justifies an intervention to change the child’s rate or course of development so as to synchronize function among different developmental domains or to align function with expectations for activities and participation. Ultimately, this brings us to the diagnostic term developmental phonological disorder (DPD), which corresponds to one of the superordinate categories in the Speech Disorders Classification System as originally formulated (Shriberg, Austin, Lewis, McSweeny, & Wilson, 1997). DPD can be contrasted with normal (or normalized) speech acquisition, differentiating those children whose speech development is progressing as expected from those children who, at ages younger than 9 years, are producing more speech errors than would be expected for their age. Nondevelopmental phonological disorders denotes those cases where the speech difficulty has its onset after 9 years of age. Speech differences arise from cultural and linguistic diversity and are not considered to be a speech impairment (although a speech difference may overlap with a coexisting health problem and may have functional consequences for an individual’s participation in some environments). The outcome of the initial assessment of a child who is referred due to concerns regarding speech accuracy or intelligibility should be a diagnosis with respect to one of these 4 major categories. Subsequent to an initial diagnosis of DPD the SLP may also diagnose a specific subtype of DPD, as discussed in Chapter 7. We point out here that throughout Parts II and III we remain focused on those cases where the child’s primary difficulty is with speech (and/or language and/or reading). We do not specifically cover secondary phonological disorders in which the child’s speech delay is directly associated with impairments of sensory systems, cognitive deficits, craniofacial anomalies or other developmental disorders. The assessment and treatment procedures to be described are applicable to children with secondary speech delay with modifications to take these specific developmental conditions into account however. Compton, A. J. (1970). Generative studies of children’s phonological disorders. Journal of Speech and Hearing Disorders, 35(4), 315–339. Howard, S. J. (1993). Articulatory constraints on a phonological system: A case study of cleft palate speech. Clinical Linguistics and Phonetics, 7, 299–317. McLeod, S., & Threats, T. T. (2008). The ICF-CY and children with communication disabilities. International Journal of Speech-Language Pathology, 10, 92–109. Noble, K. G., Wolmetz, M. E., Ochs, L. G., Farah, M. J., & McCandliss, B. (2006). Brain-behavior relationships in reading acquisition are modulated by socioeconomic factors. Developmental Science, 9, 642–654. Pamplona, M. C., Ysunza, A., & Espinoza, J. (1999). A comparative trial of two modalities of speech intervention for compensatory articulation in cleft palate children: Phonological approach versus articulatory approach. International Journal of Pediatric Otorhinolaryngology, 49, 21–26. Shriberg, L. D., Austin, D., Lewis, B. A., McSweeny, J. L., & Wilson, D. L. (1997). The Speech Disorders Classification System (SDCS): Extensions and lifespan reference data. Journal of Speech, Language, and Hearing Research, 40(4), 723–740. Shriberg, L. D., Tomblin, J. B., & McSweeny, J. L. (1999). Prevalence of speech delay in 6-year-old children and comorbidity with language impairment. Journal of Speech, Language, and Hearing Research, 42(6), 1461–1481. I have had an interesting conversation with some orthophonistes from the Québec community who have their own very excellent blogs, Cuit dans le bec (Mélissa di Sante and Marie-Pier Gingras) and Langage et cie (Marie-Pier Gingras). They asked my opinion regarding a debate that arose on their sites and the issue is so interesting that I am replicating my thoughts here, first with English examples and then finishing up with a French example although the evidentiary basis for making diagnostic decisions in the French context is much weaker. The question that arose was which type of normative data is most appropriate when making decisions about whether a child’s speech is within normal limits or not – age of acquisition norms for segments OR age of suppression norms for phonological processes? The specific example given was the case of a child who misarticulates /f/ – does it matter whether the child stops this fricative (i.e., /f/ → [p]) or makes some other kind of substitution error (e.g., /f/ → [s]). Would this difference in type of error impact on the severity rating for the child’s speech delay? As it happens I am about to administer the final exam in my fall course on Phonological Development and most of the exam questions will require the students to make exactly this judgment – given a sample of speech from a child of a given age, is the child’s speech within normal limits or not? I teach my students to use and integrate across multiple sources of normative data. It is essential to consider these multiple sources with no one source being more important than any other, specifically: (1) a standardized measure of the total number of errors; (2) phonetic repertoire; (3) segment level age of acquisition norms; (4) phonological process norms; (5) information about atypical versus typical errors; (6) normative data about the development of prosodic structures from a multilinear perspective where available; (7) intelligibility and other “whole word” measures of speech production. In many cases all of these sources of data will line up with each other so that you could use any one and get the same answer but very frequently there are discontinuities between sources of data and therefore you must integrate across these different perspectives and use your clinical judgment. I will provide some examples of cases where the different types of normative perspective do not provide a congruent result. Male child aged 36 months produces /f/ → [p], /v/ → [b], /s, ʃ, ʧ, θ/ → [t], /z, ʤ, ð/ → [d] and has no fricative sounds in the phonetic repertoire. The Iowa-Nebraska norms indicate that the expected age of mastery for these phonemes is 3;6 for /f/, 5;6 for /v/, and between 7 and 9 years for the remainder. I have known SLPs who would tell parents that there is no need to be concerned about a child like this because the child is younger than the expected age of mastery for all of the phonemes in error but in fact this would be the wrong conclusion – because indeed the type of errors produced by the child does make a difference. We know that a child at the age of 24 months is expected to have fricatives in the phonetic repertoire. Furthermore, stopping of fricatives should be suppressed (occurring with less than 20% frequency) before the age of 30 months. On the other hand, let’s say we have another male child aged 36 months who produces /f/ → [p] and /v/ → [b] in the word initial position but /f/ → [s] and /v/ → [z] in the word final position; /s, ʃ, θ,/ → [s] in all word positions and /z, ð/ → [z] in all word positions. Furthermore Percent Consonants Correct in Conversation is 80% and whole word accuracy in conversation is 80%, scores that are within normal limits according to published norms. In this case a conclusion of age appropriate speech could be warranted because the error phonemes are not expected to be mastered at the age of 36 months and the errors are all of the type that are typically observed in children of this age and the stopping that is observed is not pervasive. A male child produces errors on the following consonant targets on the Goldman-Fristoe Test of Articulation: /k/ (i,m,f), /ɡ/ (i,m,f), /ʃ/ (i,m,f), /ŋ/ (m), /s/ (i,m,f), /z/ (i,m,f), /sl/, /sp/, /st/, /sw/. Fronting of velar stops is pervasive in the child’s speech. In this case, because the child is 5;0 and he has made 20 errors, a percentile rank of 29 is obtained which might suggest that the child’s speech is within normal limits warranting a discharge recommendation except that fronting should be suppressed by age 3 years and fronting in the coda position in particular is atypical. Therefore this child should be eligible for an intervention despite his GFTA score. Male child age 5 produces errors on the following consonant targets on the Goldman-Fristoe Test of Articulation: /ʃ/ (i), /ʧ/ (i), /ʤ/ (i,m), /l/(f), /r/(i,m), /ɡr/, /kr/, /tr/. These 10 errors would yield a percentile ranking of 48 and the child’s speech could clearly be judged to be within normal limits given that the expected age of mastery is 6 years for the first 4 consonants and 8 years for the /r/. However, what if the child’s speech intelligibility in conversation was found to be only 80%? Then this child would have what is called an intelligibility-speech gap because his consonant accuracy is within normal limits but his connected speech intelligibility is below the expected 100% intelligibility. This gap can be observed in children who have experienced chronic otitis media and may reflect imprecision in the production of consonants and vowels and a reduced vowel space. It is possible that some kind of intervention might be warranted in a case like this. Male child aged 6 years consistently produces initial and medial /l,r/ → [w] and final /l,r/→ [o]. There are no correct liquids in the child’s repertoire. Here again the difference in normative expectations for phonological processes versus segments must be kept in mind. Mastery of /l,r/ is not expected until ages 7 and 8. However, gliding and vocalization of these liquids is not expected after the age of 5 years. Even a 24 month old child is expected to have a liquid in the phonetic repertoire. Therefore this child’s speech is concerning even if the GFTA score is within normal limits and the child is younger than the expected age of mastery for these phonemes. In French it is very important to take word and phrase structure into account but unfortunately we don’t have as much normative data as we need in order to interpret child performance reliably. We know for example, that when naming simple words, all consonants should be at the level of at least customary production (in fact most are mastered) before age 5 years in French. Therefore if we take the case of the 5 year old male child again, if the child is producing the words “giraffe” → [ziʁas] and “éléfant” → [elesã] then these productions are not age-appropriate. On the other hand, if the child is producing the words “giraffe” → [ʒiʁaf] and “éléfant” → [elefã] then these productions are correct and age-appropriate. What if the child produces the simpler words correctly but says “fromage” → [kʁomaʒ] and “framboise” → [kʁãbwaz]. Surprisingly these strange looking cluster productions might not be concerning in French. Firstly, error frequency is strongly conditioned by syllable stress and position. Therefore, the /f/ targets in “giraffe” → [ʒiʁaf] and “éléfant” → [elefã] are easier because they are in the stressed word-final/phrase-final position. Secondly, the /f/-clusters in French are vulnerable to spreading of the Dorsal feature in /ʁ/ to the initial obstruent, especially in non-final contexts such as this. Although this error is less frequent than simple reduction (e.g., “framboise” → [ʁãbwaz]), the spreading error occurs with greater than 5% frequency, and is therefore not atypical in French. One thing to keep in mind is that although the segment acquisition norms suggest that consonant acquisition is more or less complete by age 48-53 months, phonological development continues through age 7 years just as in English because mastery requires consistency in the long words that are characteristic of French and in connected speech. French does not have lexical stress per se but phrase level prosody is important. The child may be able to label the picture as ‘fourchette’ but a phrase such as ‘J’ai perdu ma fourchette hier.’ puts the /f/ target in a more difficult context. We need phrase level normative data for French and studies that manipulate syllable complexity, syllable stress and word length variables systematically before we can be really clear about the normal course of phonological development in French. Nonetheless, testing children’s consonant acquisition in the context of words that are consistent with French word structure is important and therefore I would examine Percent Consonants Correct on a screener such as our Test de Dépistage Francophone de Phonologie in addition to considering the segment acquisition norms in MacLeod et al which are based on words with relatively simple structure. Rvachew, S., & Brosseau-Lapré, F. (2012). Developmental Phonological Disorders: Foundations of Clinical Practice. San Diego, CA: Plural Publishing. Austin, D., & Shriberg, L. D. (1997). Lifespan reference data for ten measures of articulation competence using the speech disorders classification system (SDSC): Waisman Center on Mental Retardation and Human Development, University of Wisconsin-Madison. Cahill Haelsig, P., & Madison, C. L. (1986). A study of phonological processes exhibited by 3- 4- and 5-year-old children. Language, Speech & Hearing Services in Schools, 17, 107-114. Schmitt, L. S., Howard, B. H., & Schmitt, J. F. (1983). Conversational speech sampling in the assessment of articulation proficiency. Language, Speech & Hearing Services in Schools, 14, 210-214. Shriberg, L. D., Flipsen, P., Kwiatkowski, J., & McSweeny, J. L. (2003). A diagnostic marker for speech delay associated with otitis media with effusion: the intelligibility-speech gap. Clinical Linguistics & Phonetics, 17, 507–528. Smit, A. B. (1993). Phonological error distributions in the Iowa-Nebraska Articulation Norms Project: Consonant singletons. Journal of Speech and Hearing Research, 36, 533-547. Smit, A. B., Hand, L., Freilinger, J. J., Bernthal, J. E., & Bird, A. (1990). The Iowa articulation norms project and its Nebraska replication. Journal of Speech and Hearing Disorders, 55, 779-798. Stoel-Gammon, C. (1987). Phonological skills of 2-year-olds. Language, Speech & Hearing Services in Schools, 18, 323-329. Bérubé, D., Bernhardt, B., & Stemberger, J. P. (2013). Un test de phonologie du Français: Construction et utilisation. Canadian Journal of Speech-Language Pathology and Audiology, 37(1), 26-40. Brosseau-Lapré, F., & Rvachew, S. (2014). Cross-linguistic comparison of speech errors produced by English- and French-speaking preschool age children witih developmental phonological disorders. International Journal of Speech-Language Pathology, Early Online, 1-11. I answered that I am not comfortable with releasing the licence directly to parents because I would prefer that the parent be working under the guidance of an SLP so the best thing is for the SLP to apply for the license on behalf of the parent via flintbox . (By the way I have worked out a way to make this old software run on 64-bit computers – you can download instructions in the revised BACKGROUNDER from the flintbox site. The tablet app is still under construction but I am hopeful that it will be available in 2014). Further to the topic of parent application of SAILS, I also sent Gissella a copy of my paper – Rvachew, Nowak, & Cloutier (2004) – describing a randomized control trial in which we taught parents to administer SAILS to their children in the clinic, after their child’s regularly scheduled speech therapy session. Children in the control group played with Living Books after their speech therapy session and their parent asked them questions about the story according to s cripts that we provided. 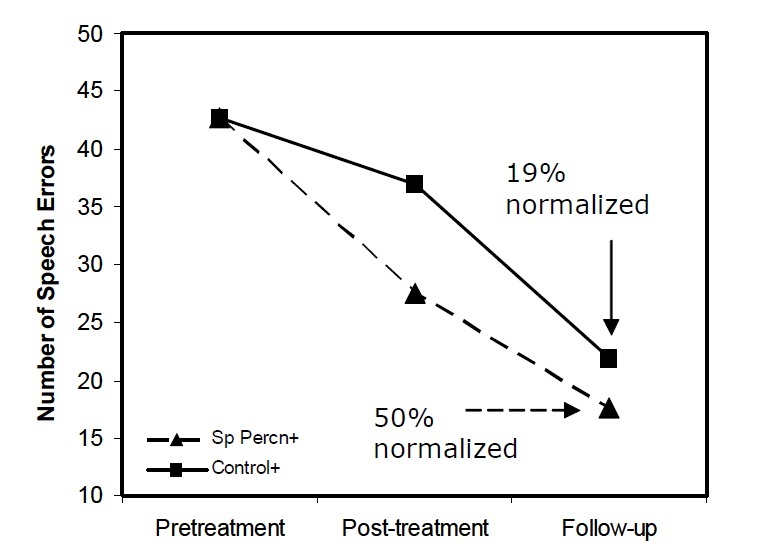 Both groups showed similar gains in phonological awareness but the SAILS (Sp Percn) group made dramatically better improvements in articulation accuracy as measured by number of errors on the Goldman-Fristoe Test of Articulation (see Figure inserted into this post) and by Percent Consonants Correct as reported in the paper. In that study we didn’t send SAILS home with the parents – as Gissella commented in a subsequent e-mail: “I now realize that the frequency of once per week seems to be sufficient, and therefore it can be done within the clinic most of the time, no need for the parent to do this at home.” This is absolutely correct, in all of my studies we have found that the intensity of the speech perception intervention does not have to be that great – a 20 minute session once per week during the first three sessions on a new phoneme works just fine. In a follow-up e-mail, Gissella had another really interesting question however; “often times parents ask if they can have this program at home as they see it is easy to use and enjoyable for the child. There has been one case where we had treated the phonological delay, but there was residual articulation (frontal lisp) that will be treated at a later time. The parent had seen how SAILS worked for the phonology part and was interested in continuing exposing the child to the samples for /s/.” I think that this would be a really interesting application for SAILS but unfortunately there is no empirical evidence to prove that this would be effective. I have always wanted to do a randomized control trial in which children with residual errors in kindergarten were treated with SAILS and then measures of speech accuracy, functional communication and psychosocial outcomes were collected at 6-month intervals for the next two years. Would we see more cases of “spontaneous” resolution of the residual errors in the SAILS group than in the control group? Unfortunately I can’t get decent funding for randomized control trials that involve even children with severe speech sound disorders so I doubt that I could get enough funding for something like this (to have enough statistical power it would have to be a big multisite study with a lot of funding even though 18 percent of 8 year olds can be expected to have speech errors; see Roulstone et al., 2009). You cannot believe how often other researchers, even those working in the field of speech sound disorders, tell me that this most common of neurodevelopmental disorders is just “not important” (see Bishop, 2010)! Françoise and I are starting to get feedback on our book and we are beginning to hear that in the Québec community we are considered to be somewhat “out there” (in the words of one reader, “those two think differently”). Having spent 928 pages expounding on the many ways in which we think differently on the topic of developmental phonological disorders we are pleased that readers are noticing this. But we are surprised to find that the evidence of our “different thinking” is apparently in the title: readers are suspicious of the content of the book because our use of the use of the term “developmental phonological disorders” diverges from ASHA’s term “speech sound disorders”. Given that the preferred descriptor for children with inaccurate or unintelligible speech in Québec is “troubles phonologiques” this is somewhat puzzling but to be sure there are a myriad of terms in use and plenty of room for confusion. In fact we do not eschew the term “speech sound disorder” but see it as a broader cover term that encompasses all of the categories of speech problems that may be observed in children while “developmental phonological disorder” is a more specific subcategory described in the Speech Disorders Classification System (Shriberg et al., 1997). In reference to the 1997 Speech Disorders Classification System the term Developmental Phonological Disorder refers to children with Speech Delay (persisting substitution and deletion errors in children younger than 9 years of age), or Developmental Apraxia of Speech, or Residual Speech Errors (an update to this nosological framework is described in Shriberg et al. 2010 and in our book). Nondevelopmental Speech Disorders and Speech Differences are excluded from the category. I retain the term Developmental Phonological Disorders from the 1997 framework because, as we demonstrate in our book, children in all these categories (Speech Delay, Apraxia, Residual Errors) face developmental challenges in the acquisition and integration of knowledge at the acoustic-phonetic, articulatory-phonetic and phonological levels of representation. Furthermore and most importantly, a majority across all three subcategories have specific underlying problems with phonological processing. Speaking for myself, I am profoundly uninterested in any arguments about what to call this particular population of children. I would not criticize anyone else’s choice anymore than I would argue about whether the four footed friend currently sleeping on the dining table should be called “that darn cat” or “le maudit chat”. Ultimately, speech-language pathologists (or speech therapists or orthophistes) are constrained by local rules and customs. In the U.S. the terms “developmental” and “delay” are both avoided because the insurance companies apparently won’t support the treatment of developmental delays regardless of whether this makes any sense at all. Some battles are not worth fighting. We can let the insurance companies tell us what to call things but we shouldn’t let insurance companies (or psychologists or psychiatrists or neurologists or anyone else) tell our profession how to think about the children that we treat. It is important to always be clear about the characteristics of the children to whom we are referring. For example, it is quite common for reviewers to suggest that my research not be funded because, after all, speech delay is not really important given that children with speech delay have good outcomes unlike children with language impairment. This is a misreading of the long term follow-up studies in which the sub-population with “speech disorder” is usually defined to cover residual errors, voice and fluency cases. In those same studies, the selection of cases called “language impaired” will include children with concomitant speech sound errors or a past history of speech delay. And as Anne Tyler has shown in her lab and we have shown in ours, children with poor speech intelligibility inevitably have difficulties with finite verb morphology, long considered to be a primary marker for specific language impairment. In other words, speech sound disorders cannot be less important than language impairment because many times we are talking about the same kids with the same underlying neurodevelopmental disorder of phonological processing.